My berry hoarding from a couple weeks ago is still going strong! We were just at Costco a couple days ago, and I picked up another big container of strawberries. They are just too good to pass up! We’ve really been enjoying eating them in breakfasts like the blueberry banana bread baked oatmeal from last week, but sometimes you just need a dessert. 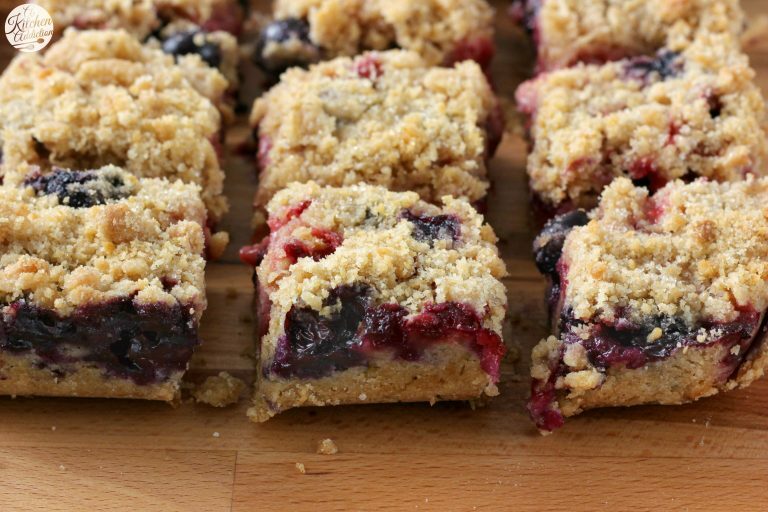 And, since it’s summer, you can’t go wrong with a fruit filled crumb bar! 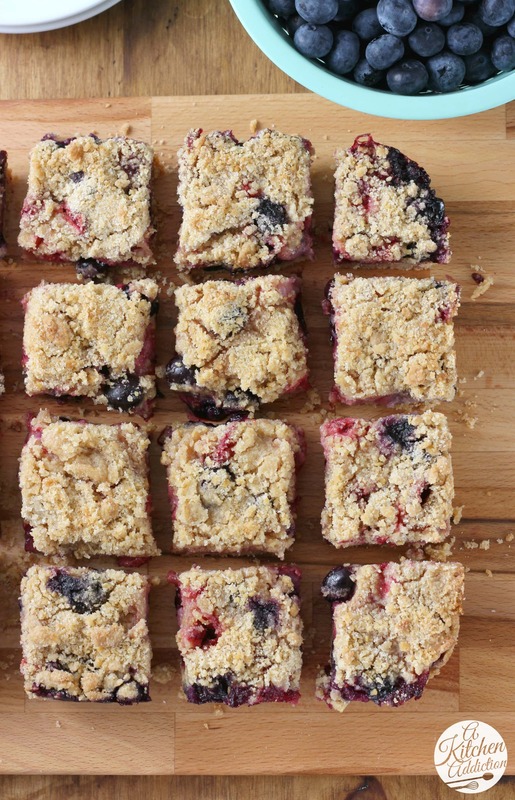 So, strawberry blueberry crumb bars have been our new quick and easy summer dessert. If you’ve never made crumb bars before, you really should give them a try. They are super easy to make. You basically use the same mixture for both the crust and the topping. I just added a little coarse sugar on top to give it a bit of a crunch. And the filling? No boiling the fruit. Just stir all the filling ingredients together, and spread it over the top. To bring out the flavor of the fresh berries a bit more, I threw in fresh lemon zest into the crust and tossed the berries with fresh lemon juice. The tartness of the lemon balances perfectly with the sweetness of the berries. Top with the remaining crust mixture, sprinkle with sugar, and bake. Eat them warm, eat them cold. It’s good both ways. Though if you have some vanilla ice cream on hand, I highly recommend eating at least one of the bars warm with a scoop of ice cream! Preheat oven to 375. Line an 8x8 or 9x9 inch baking dish with parchment paper. In a large bowl, whisk together flour, sugar, baking powder, salt, and lemon zest. In a small bowl, whisk together the egg yolk and vanilla extract. Stir into dry ingredients. Cut in butter until mixture resembles coarse crumbs. Press about ⅔ of mixture into the bottom of prepared baking dish. In a separate bowl, whisk together sugar and cornstarch. Stir in lemon juice. Add in strawberries and blueberries. Stir until berries are coated. Spread berry filling over the top of crust. Top with remaining crumb mixture. Sprinkle with coarse sugar. Bake for 35-40 minutes, or until top is golden brown. Allow to cool before cutting into bars. Sprinkle with additional lemon zest and serve. Oh my goodness, these bars look SO amazing, Jessica! I’m a total sucker for lots of crumb topping and you totally nailed these beauties!! I can never resist crumb bars, especially when strawberries are involved. These look fantastic, Jessica! I just want to dig in for breakfast! 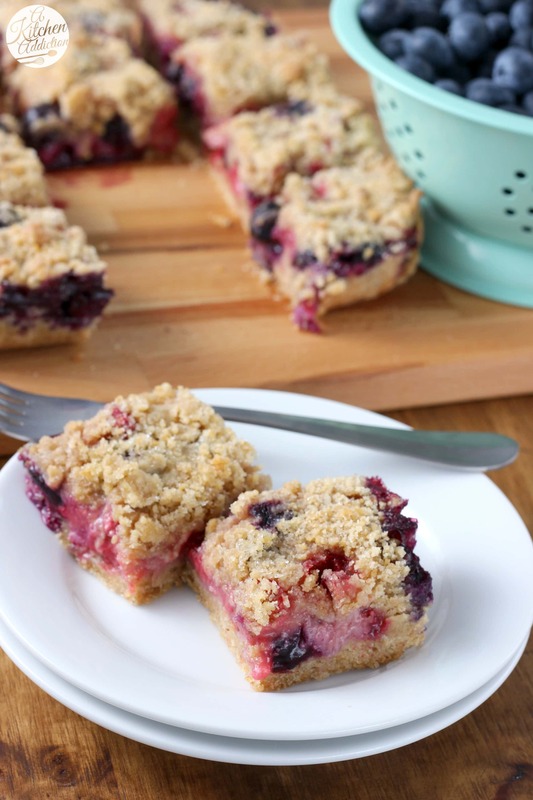 I make blueberry crumb bars all the time, but I love that you added strawberries to this. I can’t wait to try! I love crumb bars. And you can’t go wrong with strawberry blueberry combo!!! I love baking with strawberries. 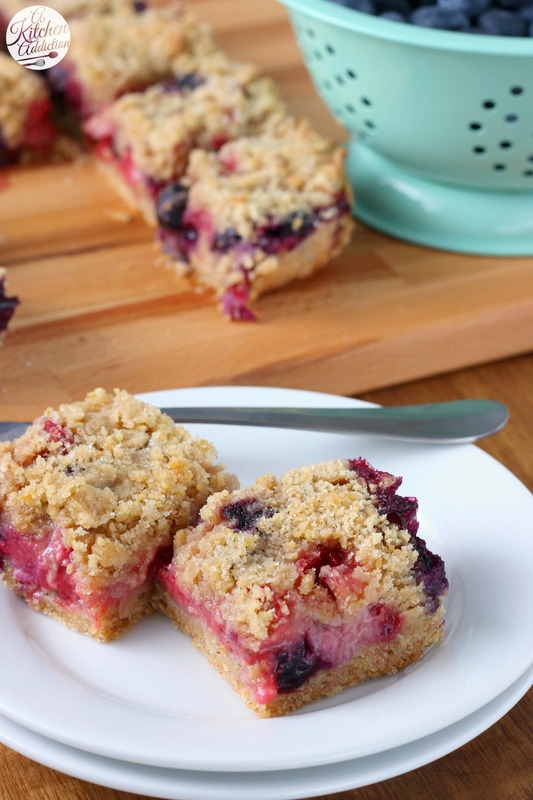 They’re so sweet and delicious, and I love the streusel on these crumb bars- awesome! These bars look scrumptious – I love that thick crumb layer – yay for hoarding ALL the berries! I don’t think you can have too many berries hanging around! 🙂 This is a great summer treat! Crumb bars are something I don’t make often enough. Because I LOVE crumb topping and there’s no better way to showcase some gorgeous juicy berries! These looks so simple!! Our Sams Club often has the best berries too. BIG boxes of them. haha I’m with you on the berry hoarding. I bought so many last week that I caved in and froze some! But I should have made these bars! Thank you for this amazing recipe. I have made 2 batches so far. It’s like two of my favorite deserts which are blueberry and strawberry crumble and gooey butter bars were mashed together. This recipe is definitely a keeper. Just made these! they are delicious! Thanks! 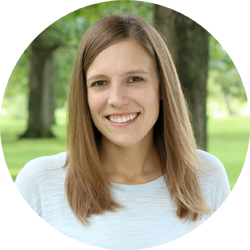 By chance have you figured out the nutrition information on any of your recipes? I am adding this to my favorite recipes, great snack for my toddler too!! Made these tonight because I had berries that were too sad to eat but not yet gone bad. Switched out flour for whole wheat flour and was not diasppointed. Everyone in the house is happy and it was such an easy thing to pull together!